Optowide Technologies will exhibit Molded Glass Aspheric Lenses, Telecom Filter, High Power Fiber Components, Advanced Coating Products, Precision Optics Products and Micro Optics for 40G/100G/400G Transceivers at Booth 4709, Mar. 15 - 17, San Diego Convention Center, San Diego, California, USA. 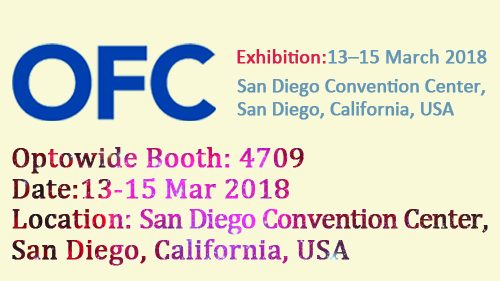 We are looking forward to seeing you at OFC 2018 in our booth.